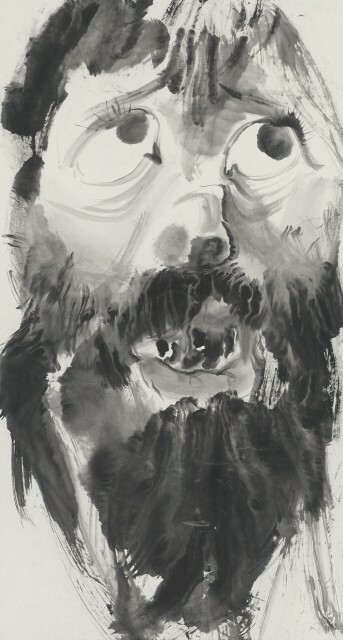 INK studio is proud to announce its exclusive representation of the pivotal new series of monochrome paintings by internationally renowned artist Li Jin. Inaugurating a new phase of his career, these paintings will be revealed in the upcoming exhibition, Li Jin: Being, which will open on May 28, 2016. The exhibition is curated by Artistic Director Britta Erickson, who for years has been discussing with the artist the possibilities of pure ink. The easily recognizable paintings of Li Jin's (b. 1958, Tianjin) middle period present scenes of consumption and sexual intimacy, filled with images of food and quirky figures reveling in the pleasures of the flesh. The color and subject matter are so beguiling that the brushwork can go unnoticed. Now, having explored the subtleties of color washes for two decades, Li Jin has translated them into a masterful and yet free-spirited control of tonality—the "five colors of ink." It is as if he has constantly honed his brushwork behind a veil of color and humor, and now finally lifts the veil for us to appreciate the results. Li Jin paints at an immersive scale on both the floor and on the wall, wielding specially-made large brushes and alternating between expressive gestures and meticulous drawing. Exploiting fully the interplay between figuration and abstraction, and between conscious control and the accidents of liquidity and gravity, the works recall historical paintings associated with Chan Buddhism and the xieyi and "splashed-ink" manners of traditional masters like Liang Kai, Xu Wei, and Bada Shanren. By embracing the self-portrait, Li Jin harkens back to the very origins of the aesthetics of Chinese painting—portraiture of moral paragons and extraordinary persons such as the Seven Sages of the Bamboo Grove. Here his quasi-autobiographical figures are no longer contemporary merrymakers, but resemble ascetics and spiritual adepts of a timeless past. Animated by the calligraphic expressivity of literati painting, the figures capture the subtlest nuances of human emotion and existence. Vegetables and cuts of meat, too, gain personalities and moods of their own as independent subjects rendered much larger than life. Along with the new series, we present Li Jin's rarely-seen paintings from the 1980's and 1990's, when he was a young wanderer and sojourner in Tibet in search of an authentic and primal connection to nature. Pulsating with the intensity and fragility of life that he experienced there, the Tibet-period works relate strikingly to his new series, which itself represents another return to a state of pure and unencumbered creativity. Seeing both together, one gains a holistic view of Li Jin as artist and thinker.